The Drum Corps International Fan Network will power three days of webcasts this week during the Bands of America Grand National Championships. Don't miss this opportunity to watch more than 90 of the most talented marching bands from across the country as they converge on Indianapolis' Lucas Oil Stadium Thursday, Nov. 10 through Saturday, Nov. 12. 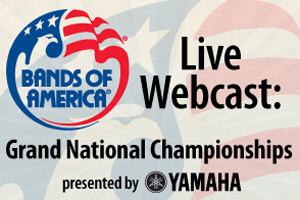 Pay-per-view options to watch the individual events live start at $19.95, or order a $59 subscription for full access to the Grand Nationals in addition to on-demand videos from Music For All's 2011 series of regional events. Learn more and register today at mfa.thefannetwork.org.